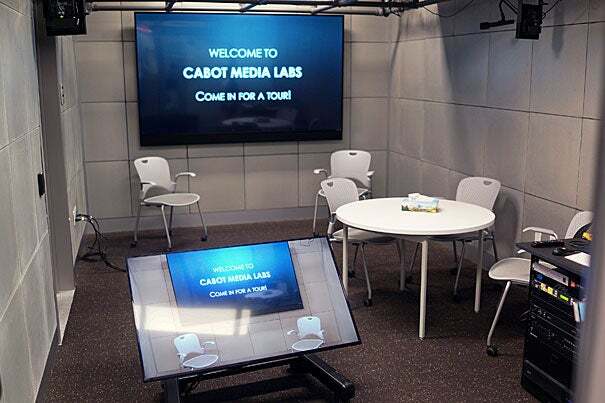 Two students work on projects at the Cabot Science Library, where brand new multimedia studios provide students the opportunity to turn their ideas into everything from podcasts to films. In the next four years, today’s freshmen will spend about 2 million minutes at Harvard, and precisely where to devote them can be overwhelming. They can get a little help with that decision at the Cabot Science Library. There, sophomores Rosan Bishwakarma and Lucas Ward created a new podcast that shares graduating seniors’ stories, advice, and insights on everything from writing a thesis on Beyoncé to balancing athletics and academics to graduating early to getting involved in a political campaign. The casual and collaborative approach helps freshmen make sense of Harvard’s many resources. Coincidentally, they next walked through Cabot and saw one of their friends in the media studios. They were off and running with their idea: connecting with library staff, learning how to use the equipment, and scheduling guests. After that, “It was just about hitting record and having a good conversation,” Ward said. 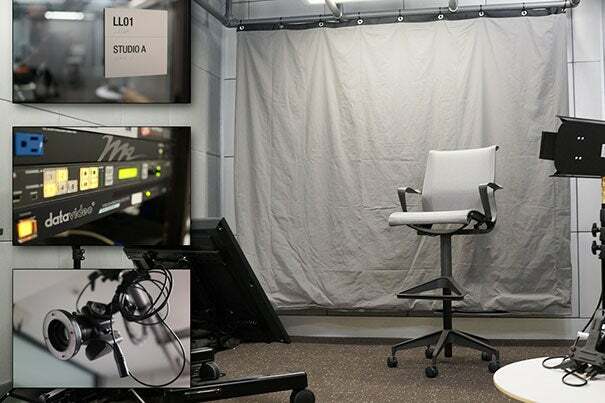 The multimedia studios sit past the library’s glass-walled study rooms. Each has a green screen, microphones, lighting board, and camera, everything but the imagination and flash drive needed to bring tangible form to students’ ideas. “Students have a million ideas,” said Paul Worster, a multimodal learning librarian who helps run the studio. After a brief orientation with the space and equipment, anyone in the Harvard community can reserve to produce their own creative work, and extra help is available from librarians and student employees next to the Macs used as editing bays. Podcast recording is just one way to use the new space. Other projects on deck include TED-style talks for a psychology class, instructional videos on 3-D scanning, and a children’s educational show using puppets as teaching tools. The studios encourage both collaboration and learning. “We want to empower [students] to be creative on their own with the tools they have,” said Susan Berstler, a technology specialist involved in the studio. The Cabot team enjoys “when the lightbulb goes on and students take ownership of their ideas,” she said. To reserve space in the studios, please email cabcirc@fas.harvard.edu. A portrait of S. Allen Counter met those who came to pay tribute to him during a memorial service held this past week at the Memorial Church.